I've spent years trying out different workout headphones, and over the years they've all disappointed me. Either they weren't sufficiently comfortable, or they would fall out, or their cords would get in the way, or the sound would be lacking. 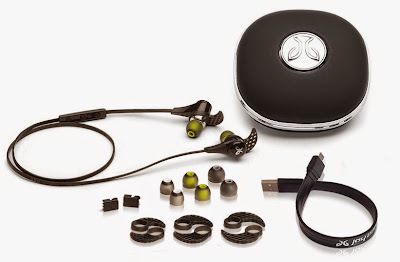 Well my search for the perfect workout headphone ended when my JayBird BlueBudsX Sport Bluetooth Headphones arrived. They fit great. They sound great. They never fall out. They have an incredible 8 hour battery life. And I can take phone calls with them if need be. The headphones come with multiple sizes of ear stays and tips, but I also bought the third party Comply noise isolating memory foam tip replacements for them and this made what was already a great purchase, a perfect one. If you're looking for a special Christmas gift for a gym rat, look no further. $130 - and if you'd like, here's an Amazon Associates link to grab a pair.